When war broke out in 1914, it was assumed that the fighting would be over quickly, well before any new capital ships could be completed. The ships of the 1914-1915 building program, three Revenges and a Queen Elizabeth, had yet to be laid down. One of the Revenges and the Queen Elizabeth were being constructed at the Royal Dockyards, and were promptly cancelled, freeing capacity for other, more urgent, vessels. However, the last two ships, Renown and Repulse, were being built under contract in private yards, Palmers and Fairfield respectively. Cancelling these ships would incur significant penalties, and work on them was allowed to proceed. Into this picture came Jackie Fisher, who had invented the battlecruiser and continued to believe it would one day displace the battleship. After the Battle of the Falklands in December 1914, where Invincible and Inflexible performed well, running down a German squadron that had been attacking British trade, Fisher proposed that Repulse and Renown be redesigned as battlecruisers. His initial proposal was for a 32-kt ship with two twin 15" turrets, 4" secondary armament, intended to save weight relative to the 6" weapons used on the most recent capital ships, and armored like Indefatigable. He soon added a third turret to his requirements, along with a pair of torpedo tubes, and the Director of Naval Construction, Eustace Tennyson D'Eyncourt, produced a design that matched these specifications within three days. This design was swiftly approved, and detail work began only 9 days after Fisher had issued his specification. This urgency carried into the production program, and Fisher planned to complete the ships within 15 months of authorization, by March 1916. The resulting ships were very close to the original design, with 6 15" and 17 4" guns, most in triple mounts. The great speed required, four knots faster than Tiger or any other capital ship, meant that the ships had to be very long, 750'. Palmers was not equipped to build a ship of this length, and the contract and accumulated material were transferred to John Brown. Despite this, they were slightly lighter than Tiger, mostly because their armor belt was a mere 6", while the deck was only an inch. A small bulge was fitted as well, to provide some protection from torpedoes. Jackie Fisher resigned in May 1915 after the failure of the Gallipoli campaign, and without his patronage the ships were delayed slightly, completing about six months late. Despite the delay, the rapid construction of these ships is an accomplishment matched only by that of Dreadnought in the annals of the battleship. However, when they commissioned after the Battle of Jutland, it was believed that the lightly-armored battlecruiser was far too vulnerable, so the ships were the subject of much criticism. That criticism, and the general calming of the war at sea, meant they saw little action before the end of the war. Fisher was also responsible for the other class of battlecruisers completed during the war. He was a strong advocate of attempting to land troops on the Baltic coast of Germany, outflanking the trench lines and threatening both Berlin and the ancestral homeland of the German officer corps in East Prussia. To support this, he ordered three "large light cruisers",1 the Courageous class. The first two ships, Courageous and Glorious, were armed with two twin 15" turrets, 4" secondaries, and torpedoes. Capable of 32 kts, they had only 3" belts, as in contemporary light cruisers, a 1" deck, and a draft of 22'. The apparent theory was that the Grand Fleet would pin the High Seas Fleet in the North Sea, leaving the Baltic only defended by pre-dreadnoughts. Fast, heavily-armed ships would be able to destroy these with relative impunity, as contemporary fire control had serious problems with fast-moving targets, and their weapons and deck armor would be much superior to that of the German ships at long range. Their shallow draft would allow them to go close to shore, in waters that the larger vessels couldn't reach, and provided some degree of protection from torpedoes and mines. More protection was provided by bulges, and the entire ship displaced only 19,000 tons, a full 8,000 less than Renown. A third half-sister, Furious, was built with two 18" guns in single turrets. These massive guns, equalled only by the Yamato class, were slow-firing and largely ineffective. As a result, Furious was completed with the forward turret replaced by a flying-off deck. This was reasonably successful, and most notably saw the first landing on a moving ship.2 Later, the aft turret was also replaced with a landing-on deck, although the superstructure remained, and the resulting turbulence made landing hazardous. Later, all three ships were converted to proper aircraft carriers. Furious survived WWII, while her sisters were both lost to the Germans. On the other side of the Atlantic, the Americans had decided to enter the battlecruiser game with ships oddly parallel to the Courageous class, as part of the massive 1916 Naval Act. The USN had been trying to get battlecruisers on and off since 1908,3 and finally persuaded Congress to authorize the six ships of the Lexington class. These ships were of a rather unusual design, intended as "battle scouts", able to press home reconnaissance in the face of serious opposition, and designed, like the Courageous, as scaled-up light cruisers. The original armament was to be 10 14" guns in two twin and two triple turrets, and the belt was to be a mere 5 inches. The design speed of 35 kts was a value that only Jackie Fisher had called for in his weirder moments, and it required a very long, thin hull, 850' LWL with a beam of only 91.5'. This caused serious structural problems, and meant that only half of the 24 boilers required to supply the ship's 180,000 SHP could be fitted under the armored deck. The other half would be atop it, with the equivalent of about 4" of protection from various bulkheads and the side of the ship.4 However, this did give these boilers near-immunity to underwater attack, which would have been valuable in light of the limited depth of the torpedo defense system of these ships. To dispose of the smoke from these boilers, seven stacks were required, two of them paired abreast. The entry of the US into the war meant that the capital ship program was put on hold, and resources were focused on merchant ships and escorts to fight the U-boats. This gave the designers a chance to improve the plans. The most obvious change was the replacement of the 14" guns with 8 16"/50s in twin turrets, but a more significant one was rearrangement of the engineering spaces. Improvements in both engines and boilers meant that the number of boilers could be cut from 24 to 16, and all of the boilers could be fitted below the armored deck, and trunked into only two funnels. Cooperation between the USN and RN gave American constructors insights into the lessons of the war. Armor was improved, with a 7" belt sloped inward at 11.5°, a deck of between 1.5" and 2.25", and much better underwater protection. This was all done after Jutland, but it seems that the USN's evaluation of the battlecruiser losses agreed with recent scholarship. Unfortunately for the ships, the Washington Naval Treaty resulted in their cancellation, although two, Lexington and Saratoga, were converted to aircraft carriers and went on to serve with distinction in World War II. One of the main inspirations behind the revised Lexington was a near-contemporary design from the British, the Admiral class. 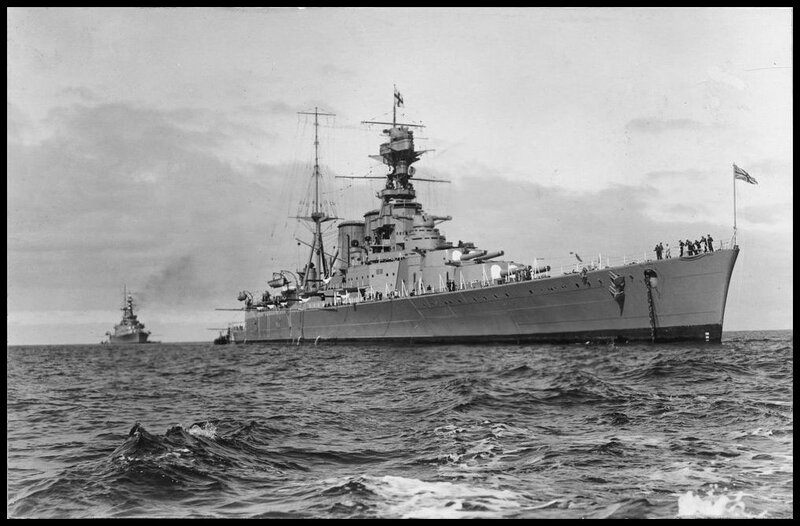 During the war, the British consistently overestimated both German build rates and the capabilities of German ships, particularly their battlecruisers. As a result, when in late 1915 the Treasury was finally willing to fund another capital ship, an improved battlecruiser was selected. Design work proceeded quickly, and on May 31st, 1916, the first ship, Hood, was laid down. She was by the largest warship of the age at 36,300 tons, with an 8" belt, sloped inward, 1.5" deck, and four twin 15" turrets. The first geared turbine plant on a battleship produced 144,000 SHP, which would have driven the ship at 32 kts. However, events that same day in the North Sea raised serious questions about the viability of such a lightly-armored ship, forcing a complete redesign. The ship that emerged was the first true fast battleship. 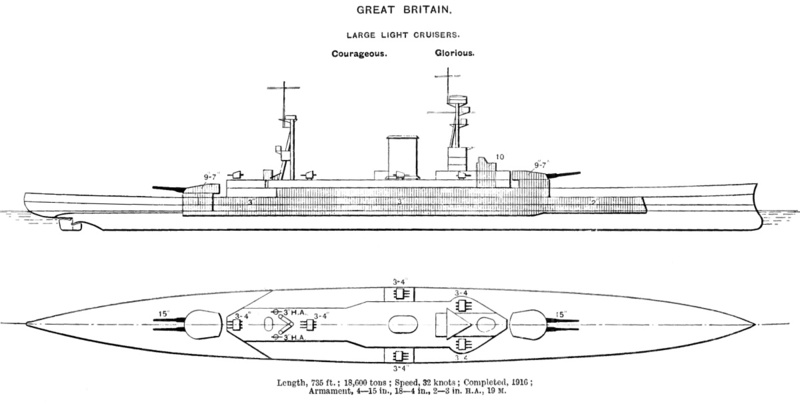 The 12" belt was sloped inward, giving the strongest protection against shellfire yet seen on any British battleship, and her deck protection was the equal of anything in European waters.5 For the first time, protection against underwater attack had also played a key part in the design, and Hood was fitted with an improved torpedo defense system that used crushable tubes to absorb energy. The propulsion plant of the original design was retained, speed falling to 31 kts, and the armament of 8 15" guns, 12 5.5" secondaries, and 8 torpedo tubes made her the equal of almost any ship afloat in terms of firepower. All of this came at a cost in size, and Hood, commissioned in 1920, was the first warship to crack 40,000 tons. Originally, three other ships of this class were ordered and laid down, but the U-boat crisis of 1917 brought their suspension, and after the war ended, it was decided that new designs, reflecting all the lessons of Jutland, were required. On the other side of the North Sea, the Germans had learned of the Admirals, and responded with improved ships of their own. The Ersatz Yorck class6 were very similar to the proceeding Mackensens, but 2000 tons was added to allow the 35 cm weapons of their predecessors to be replaced by the 38 cm guns used on the Bayern class battleships. The result was a ship rather similar to Hood, except in speed. The German vessel would only have been capable of around 27 kts. Originally, it had been planned to build seven vessels of the Mackensens, but the last three were reordered under the new design. Only the lead ship was actually laid down, and she was cancelled before too much work was done. The end of the First World War brought a major change in battleship design. While Hood could have been the harbinger of this change, fulfilling the age-old dream of combining speed, protection, and firepower, politics intervened. The prospect of another naval race was too much for war-weary nations and their strained treasuries, and a conference was called to stop it before it could start. As such, next time we'll have to take a detour from design history into the world of the Washington Naval Treaty.
" Jackie Fisher, who had invented the battlecruiser and continued to believe it would one day displace the battleship." Looking around the world in 2018 he eventually turned out to be correct. No more battleships, but a number of cruisers either on the waves, under construction or planned. Those aren't really battlecruisers, or even really cruisers. They're big destroyers. The last real cruiser was Long Beach, and she was decommissioned north of 20 years ago. But he wasn't entirely wrong even looking at dreadnought capital ships. Hood was essentially the prototype for all later battleships (except NelRod, for some reason) and she was classed as a battlecruiser. What's the distinction between a cruiser and a really big destroyer? It's a matter of design history and standards. There were different standards and requirements for cruisers and destroyers in the wake of WWII, and Long Beach was the last ship built to cruiser standards. The Burkes, though the size of small WWII cruisers, were done to a heavily modified version of the destroyer book. I'm not objecting to calling the Ticos (which are literally built on the hull of the Spruance-class destroyers) cruisers in the same way I object to calling the Kirovs battlecruisers. Terminology has moved on. But the battlecruiser and battleship did eventually merge before dying out, and the cruiser of Fisher's time is also extinct.